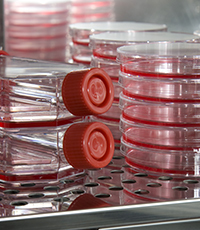 TRINOVA BIOCHEM offers advanced Media and Media Supplements for expansion and maintanance of primary cells and cell lines. HemoGro™-SF, for example, is a chemically-defined, complete base medium. For expanding specific lympho-hematopoetic stem cell populations apply CellExpand™. As xeno-free replacement for FBS (Fetal Bovine Serum) take CRUX RUFA Human Platelet Lysate. Rich in growth factors and cytokines human platelet lysate supports the growth of primary cells and various cell lines.